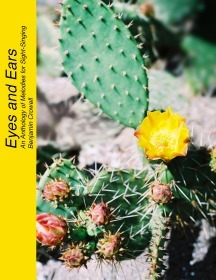 Eyes and Ears is a book of melodies for use in practicing sight-singing. You can download it for free. It currently contains about 400 melodies, arranged systematically for education. So far, I've concentrated on assembling a body of relatively easy material that would be sufficient for the first semester or two of a college-level musicianship course. There is a small amount of didactic text, but if you're going to use the book for self-instruction, you'll need some background in basic music theory, and preferably access to someone knowledgeable to provide guidance. Joel Matthys has written open-source ear training software called Latido that incorporates the melodies in Eyes and Ears. Paul Morris has made a version of the anthology that uses a nontraditional notation system called Clairnote. Printed copies are available via Lulu.com for $7.39 plus shipping. Click here to buy a copy. This is just a fun project for me, so I'm not taking any royalty from sales on Lulu. Test-drive the book. Use it for self-instruction, or, if you're a teacher, photocopy pages with materials you like, hand them out, and use them in class. Let me know how it went, and give me suggestions for improvements. Send me photocopies of public-domain sheet music. Please make sure to include the title page and copyright page so I can document the fact that it's a public domain edition. My address is 2233 Loma Alta Dr., Fullerton, CA 92833, USA. Just because a melody's original composer has been dead for hundreds of years, that doesn't mean we can use a modern, copyrighted edition of his/her work in this kind of book. The editorial work can also be copyrighted. To be safe, make sure the sheet music you're dealing with was published before 1923. (Many editions you'll find in print today are actually just reproductions of 19th-century sheet music.) Good online sources for public-domain music include the Mutopia project and the Choral Public Domain Library. It's very hard to find extremely easy pieces of sheet music for sight singing, e.g., pieces whose only leaps are between notes of the tonic triad. They're particularly valuable. With more difficult pieces, there's no shortage of material out there. Use taste and judgment. Make sure it's singable. Nearly all the melodies in Eyes and Ears are in the public domain. The source of each song is noted in the Lilypond source code. The source code archive also includes a file called "permissions" that includes the texts of some e-mails from people who have done editorial work on the tunes, giving permission for their use in this project. In cases where the Lilypond source code file was entered by me, Ben Crowell, from a public-domain source, I dedicate that particular file to the public domain. As noted in the source code, a particular Lilypond file may be from the Mutopia project, and then the editorial work that went into creating that is copyrighted by the person who did the work. A notice on the Mutopia site states that "All music is either in the public domain, released under the MutopiaBSD licence, or released under the Creative Commons Attribution-ShareAlike License." In all three of these possible cases, it is legal for you to download, copy, modify, redistribute, and sell a work such as Eyes and Ears that incorporates that melody, but in return you must comply with the relevant license, and it's up to you to look up the licensing information on the Mutopia site. As noted in the source code, many of the French folk songs are from Thierry Klein's web site, which is now defunct. These melodies are all public domain, and his transcriptions have been used with his permission. Thanks, Thierry! The melodies in the Max Hunter folk song collection at Southwest Missouri State University have been edited by Dr. Michael F. Murray, and he believes them all to be in the public domain. Other than the public-domain melodies, everything else about the book is copyright 2004 by Benjamin Crowell, and licensed under your choice of the Creative Commons Attribution-ShareAlike license or GPL v3. This includes the original music I've written for the book, as well as the copyright for the anthologizing of the melodies (i.e., selecting and collecting them, which is subject to its own copyright even though most of the melodies are public domain). The easiest way to obtain the book is simply to download the Adobe Acrobat (PDF) file. However, some people might also want to compile it from the Lilypond source, e.g., in order to customize it. Note that if you're redistributing the customized version (as opposed to just using it yourself), your customizations need to be released under the same license (that's the "share-alike" part of the license's name). To compile the book yourself, you basically just download the source code file to a Unix machine, unpack it, get in the directory it creates, and do the command `make'. You will need to have installed the following software already: LaTeX, Lilypond, Perl, flex, and bison. If you want it to construct the thematic index, you'll also need to download my open-source software Clamor (just the software, not the big file containing the samples). You have to compile and install Clamor as explained in its documentation, and then modify the file build.pl in the Eyes and Ears distribution so that the `use lib' line gives the directory in which Lily.pm is installed. If you're going to include new melodies in the book, they have to be formatted in a certain way, using a specific subset of the Lilypond language, and with certain information in the header section. Basically, you can just look at the files that are already in the book and base yours on them. If you don't do the headers correctly, the melody won't have the right title, and won't be indexed by title and composer. My script that generates the thematic index will also get upset if you use fancy features of Lilypond that it doesn't know about; all that happens then is that you'll see an error message flash by while you're compiling the book, and that particular melody will be omitted from the thematic index. (c) Copyright 1998 Benjamin Crowell. All rights reserved.